Out on the Orkney Islands, Elin has always stood out as a bit different from the others. It is not simply the webbing on her hands, but also her strong tie to the sea and the Selkies who live out there. 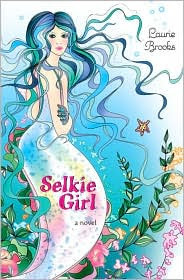 The truth is that she is the offspring of a Selkie mother who was captured sixteen years ago. Now, in one fateful evening, she helps her mother escape and flees herself into the sea. But as a half-breed, she stands out even in the sea. With time, she comes to understand that her heritage comes with both liabilities and strengths, and that she has a destiny to bring her two worlds to a better understanding of each other. While largely a fantasy, Brooks also has a strong ecological agenda in this story. Overall, the story itself works. It is original, the characters are string, and Brooks has infused the book with lots of local charm. But it is tough going. Perhaps there is too much local charm (the lingo takes some getting used to) or perhaps the story just takes a long time to kick in. In short, I found this hard to read and easy to get lost in.